The Masaru Leather Pants and REV'IT! Masaru Jacket are replacing the Rev'it GT-R models. Designed to be aggressive, yet tasteful, the Masaru jacket and pants are a fitting follow-up with its black leather and colored accents. 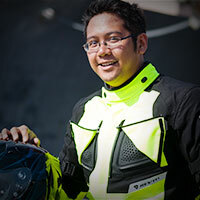 Rev'it proves that you can look sleek in leather from head to toe without looking too sportbike garish. I hope you like polka because the the Masaru pants provide all the accordion stretch you need at the waist and knees. New SeeFlex CE 2 armor provides impact protection for your knees. These are a major upgrade compared to the ProLife used in the GT-R pants. SeeSmart armor covers your hips. Ventilation panels at the front and back of the legs flow some air. Monaco Performance cowhide, PWR|Shell 500D stretch, Neoprene, and Lorica combine to give the Masaru its sharp look and protective features. It's detachable thermal body warmer extends your riding into cooler temps so chilly mornings no longer need a second thought. 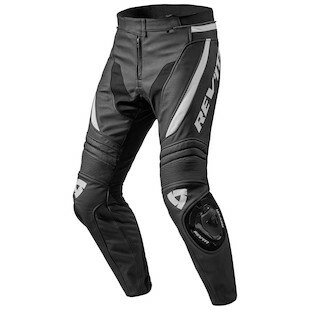 Rev'it matches the same SeeFlex CE protection from the pants at the shoulders and elbows of the jacket. Comfort cuffs, stretch lips at back, upper arms, elbows, and shoulders keep you at ease while you are working hard on the bike. The new Rev'it Masaru Pants and Masaru Leather Jacket provide stylish understated leather protection. 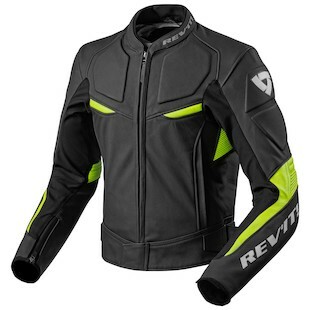 The upgraded armor is the latest and greatest in Rev'it's lineup. These leathers are made for comfort and performance when ripping through canyons, shaving off seconds on the track, or saving your hide on a daily commute.